Andy Matthew (Outside left, 1962-67) - Born in Kirkcaldy in 1932, Andy Matthew’s football career began with Kirkcaldy Rose Street Boys Club and Bayview Youth Club prior to joining East Fife He was a fixture in the East Fife line up for seven years. He was a member of the East Fife side which won the 1954 League Cup. In 1958, he signed for Rangers for a fee of £4,500. Matthew’s spell at Ibrox lasted for two seasons. Andy was a fast, direct, and orthodox winger with a finely tuned left foot. 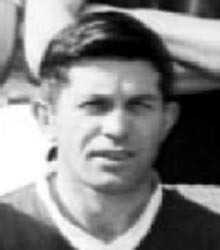 He won a League championship medal in 1959 and then played in the European Cup for Rangers. Andy then had a season with both Dunfermline and Raith Rovers before a highly successful five year stay at Central Park produced 38 goals in 145 league games for Cowden. Early in 1968, Andy was appointed manager of Cowdenbeath FC. He sensationally built a team that took Cowden back into the top flight after a 30 year absence with the club also appearing in the League Cup semi-final. All things though must pass and after 6 years as manager Matthew resigned in 1974. Later, Andy managed Raith Rovers. He died in 1992 aged just 60.